Chicago Cubs third baseman Aramis Ramirez didn't let a 2-for-22 postseason slide stop him from making a presence during Game 4 of the World Series Sunday night. 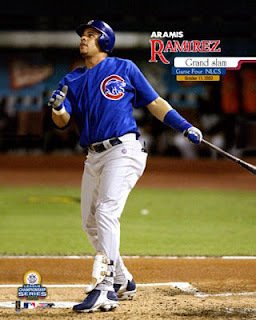 Ramirez received The Hank Aaron Award, which is given to "the most outstanding performers" in each league. I guess this means Albert Pujols can't win every award, right? As good as Rami was in 2008, he wasn't even the best offensive third baseman in the league. That distinction should go to New York Mets third sacker David Wright who hit .302 with 33 homers and 124 runs batted in. But how do you not give the award to Pujols? It's almost inconceivable. It would be easy to blame the fans that voted for Youk and Rami, but it'd be better to blame Cardinal Nation - baseball's self-proclaimed best fans - for not stuffing the ballot box for Phat Albert. In the end, it doesn't matter because Ramirez isn't winning anything important tonight or in the near future. As for Pujols he already has what Ramirez wants in his back pocket (an NL MVP ) and on his hand (a World Series ring). And after batting .357 with a .425 OBP, .624 SLG% with 37 home runs and 116 RBIs, Pujols will likely take home his second NL MVP award at the conclusion of this baseball season. As long as MLB doesn't allow fans to vote for that now, too.